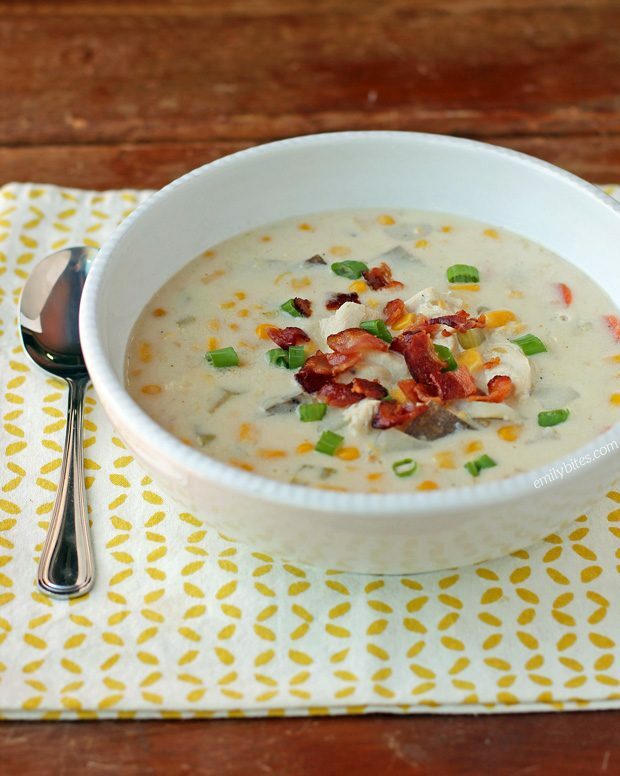 My husband has been craving Chicken Corn Chowder lately, so I decided to make a version based on two of my other popular soups, my Creamy Chicken and Wild Rice and Buffalo Chicken Soup. This recipe makes a lot of soup (15 cups! ), but my husband said to him it’s more like 3-4 servings because he ate it out of a big serving bowl (really). Needless to say, it was a big hit with Mr. Bites! 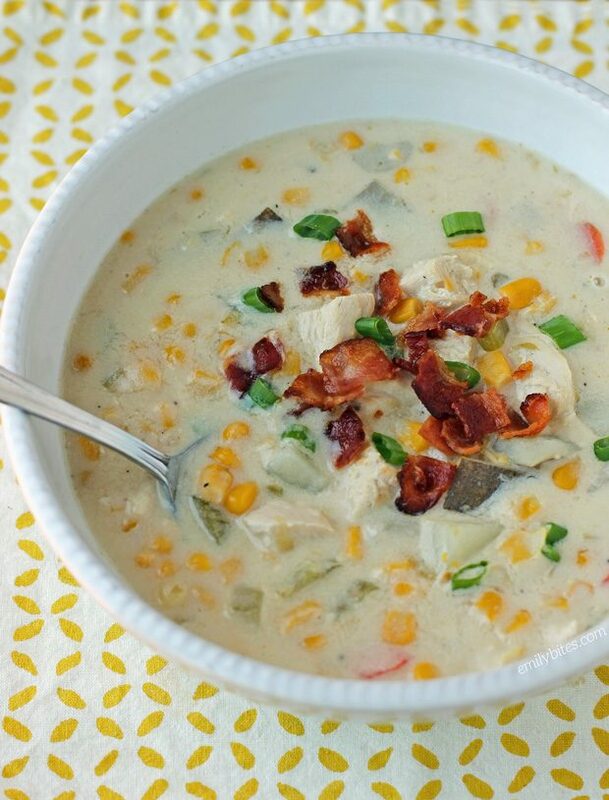 This soup is creamy and hearty with corn, potatoes, carrots, celery and chicken and it’s topped with green onions and bacon. I found a cup of it to be very filling and it would be perfect for lunch or dinner paired with a salad or sandwich. At just 183 calories or 4 Weight Watchers SmartPoints, a cup of this Chicken Corn Chowder will even leave you some calories for dessert! Looking for more tasty, hearty soup recipes? Check out my Butternut Squash Soup, Creamy Chicken and Wild Rice Soup, Zuppa Toscana, Broccoli Cheddar Soup, Slow Cooker Beef and Barley Soup, Italian Wedding Soup, Cheeseburger Soup, Spaghetti and Meatball Soup, Buffalo Chicken Soup, Chicken Tortilla Soup and more in the soup section of my recipe index! Cook the bacon according to package directions until crisp. Remove the bacon slices to a stack of paper towels to dry. Chop or crumble the bacon into small pieces and set aside. Bring the water and chicken broth to a boil in a large pot or Dutch oven. Add the chicken, potatoes, carrots and celery and reduce heat to a simmer. Cover the pot and simmer for 25-30 minutes until chicken is cooked through and easy to shred. Remove the cooked chicken breasts to a cutting board and shred or chop into small pieces. Replace the lid and continue to simmer the rest. Mix together the flour, salt, black pepper and cayenne pepper in a bowl until combined. In a medium saucepan, melt the butter over medium heat. Whisk in flour a spoonful at a time to smoothly combine with the butter. Pour the half and half in a little at a time, stirring continuously with a whisk to allow the roux to combine with the cream. Continue whisking and adding half and half until the mixture is smooth and creamy. Add the cooked chicken and the cream mixture into the soup pot and stir to combine. Add the canned and creamed corn and the diced chilies and stir. Bring the soup back to a simmer and simmer for 10 minutes or so to allow the soup to thicken and the flavors to combine. Add salt and pepper to taste. Garnish each bowl of soup with sliced scallions and crumbled bacon when serving. Made this last night for lunches this week and LOVE it. So good!! Made this for dinner last night and my 6 year old son loved it. He said he wanted to have this for dinner 100 times :). My hubby and I loved it too so it was a win all the way around. Made this chowder on Sunday and it was awesome!!! I would have been happy to have gotten this in a restaurant! Thank you! Made a double batch of this last Sunday. (Nearly 2 gallons) Thought it would get my family of four through the school/work week. I was so wrong!!!! 2 gallons = 2 days! My family loved it. My 5 year old son told me it was the best dinner I’ve ever made. I a now making another double batch for this week! Thanks for the great recipe!! Made this sans chicken today. My daughters are vegetarians, so I try to change recipes to make it something the whole family will eat. Added a little more carrots and potatoes. HUGE hit in our house! This will be a go to this winter. Thank you, thank you! Amazing as always!! Delicious flavor and so hearty!! I agree with the other comments that we didn’t have much leftovers either! Your recipes have been a life saver for me on my weight watchers journey, and my husband (who isn’t on WW) has enjoyed the dozens of meals I’ve cooked!! This soup is sooo good! Easy to follow instructions too. Definitely a keeper!!! Made this tonight and as always–win! My husband and I both LOVED it! Pretty easy to make and huge flavor. We both like a little heat so I did fire roasted corn instead of regular and it was great. Thanks Emily! Made this for lunch and it was amazing!! Love the little bit of heat in it. Will definitely be putting this one on repeat!! This was really yummy! I didn’t have half and have so I substituted with 2 tbsps of butter and nearly 2 cups milk. We really liked it! I thought it may be good with some paprika too. For the chicken, do you have to cut it up prior or just put the whole breast into th pot? Thank you! Made this for dinner last week and got rave reviews! It tasted as good as the corn chowder I spend hours making and simmering. A+ I substituted 1% milk for the half-and-half. Delicious! Next I’m trying the Creamy Chicken and Wild Rice Soup! For those who are lactose I tolerate can almond or cashew milk be substituted for half and half and coconut oil for butter? I made as directed but reacted to the dairy in the recipe. I’m sorry but I have never cooked with almond or cashew milk so I really can’t say for sure. If you give it a try please report back! I made this recipe for my husband and I and for my daughter’s family. We all loved it. I just discovered your website a few months ago, you have so many yummy recipes I want to try. I am a fan. I never can find light butter other than in the tubs. I’ve looked every where. Any suggestions for substitutions? I use a lot of your recipes and I often see light butter in them. I made this last night at a family gathering and it was gone before I could blink! Everyone was teasing me that they didn’t want to eat my “Weight Watchers” soup, but they all loved it! I think you could convert anyone to a lower calorie lifestyle with this soup. New favorite soup. My fiance made this and we’re both obsessed. Everything is in such perfect proportion! While this was delicious… I found it EXTREMELY SPICY. And I am a Louisiana girl who loves flavorful food. If I made this again I would cut the cayenne in half and or go easier on the diced peppers. Otherwise, very good. I agree. Why is no one else commenting on this? This WOULD have been really yummy if it had half the amount of cayenne pepper! Wow, even my hub wouldn’t eat it and he eats stuff that makes his eyes water and face turn red! I’d definitely recommend using 1/4 teaspoon of the pepper, or less. Was this a typo in the recipe possibly? Hi Joni, I’m honestly so confused because I’ve made this several times and my husband loves it and I literally *just* got tagged on Instagram that someone else made this and loved it too. I’m sorry it was too spicy for you and certainly next time you should use less heat but it wasn’t a misprint, that level of spiciness worked well for my family as a lot of other readers. I guess everyone is just different! Thanks for your feedback. I saw someone commented a while back asking about doing this in the crockpot. Anyone tried that? I’d use my crockpot for everything if I could lol. If I did do crockpot, how would you recommend changing the instructions? I’m a turtle in the kitchen so this took me quite a while to make, but it was sooo worth it. Love this! Just discovered this site, so far the recipes are great, I made this soup today, it was very good. I added about 2 teaspoons better than chicken bouillon and would cut the cayenne pepper in half next time. I had it with half a chibatta roll that I made into garlic bread. Entire dinner ended up being 8 freestyle points (this includes 1/2 roll, 1 tsp light butter and fresh garlic) it was a delicious satisfying meal.My husband loved it. Btw I’m in love with your chicken pot pasta recipe !! Well done. Thank you! This soup was delish. We didn’t have any green chili’s and used siracha instead of cayenne pepper, but it was soooo good. This was my first attempt at chowder of any kind and it was amazing! Made the chicken corn chowder tonight and OH MY!!!!! I’m SOO glad I did!!!! Absolutely delicious! I froze two portions of mine and when thawed, was clumpy, but heated it tasted fine. This is even better the second day. I LOVE this soup! Have you ever made this with fresh corn on the cob? I LOVE this recipe. I’m making it again this week but splitting it out using mushrooms as my sister doesn’t eat meat. I’ll just add the mushroom portion right to the regular mix. I also added more chicken since chicken is free on the new WW program. Love this! THANK YOU! !